They used to say Coke adds life… maybe it will add midichlorians. Thanks to the Disney Parks Blog, we now know that if you journey to Batuu this summer in Anaheim and Orlando, you will still find Coca-Cola products, just not in the shape you know them. In Star Wars Galaxy’s Edge, you won’t have to drink blue milk; you can get your soda as well. The genius move is that it will be in special collectible containers to be found only in the Black Spire Outpost. 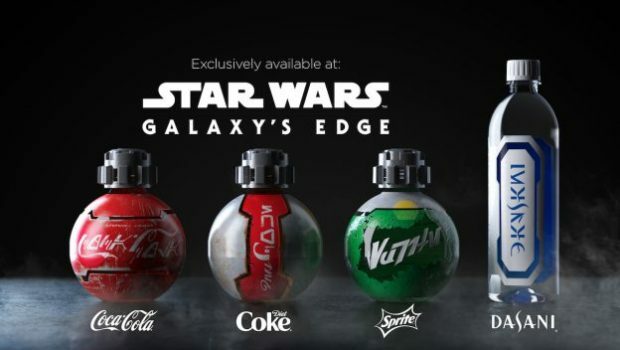 Opening May 31st in Anaheim’s Disneyland Park and August in Orlando’s Hollywood Studios, Galaxy’s Edge has plenty of unique items to offer — we just didn’t expect the Diet Coke to be unique, too. My only disappointment? No Coke Zero Sugar… yet. A couple of days ago, Disney CEO Bob Iger said that new Star Wars movies were on a bit of a hiatus after The Rise of Skywalker. Somehow, I think the franchise is going to do just fine.